Free Newsletter -- Sign Up Now! Free Newsletter--Get Your Copy Today! I promise to use it only to send you Messy Makeover Magazine. EL PASO -- They say the first step toward solving a personal problem is to admit you have one. My name is Leonard Martinez, and I'm a pack rat, which if left unchecked would have a decent chance of becoming hoarding. For as long as I can remember, I've had a problem getting rid of things. I'd keep old newspapers, magazines, heck, even toys from my youth. I'm not sure why I kept the toys. I didn't keep them in original packaging, so they are virtually worthless now. A Millennium Falcon, soldered with a kitchen knife to keep it from flying apart while escaping a TIE fighter, isn't going to garner any bids on eBay or even a second look from a nephew. It wasn't until a couple of weeks ago that I started to make the connection between my pack-rat tendencies and my inability to let go of the past. I think about the past way too much, but that's another story for another time. With the advice of a friend, who said to get rid of anything you haven't used in two years, I started to go through old boxes of miscellaneous -- er, stuff. He said I'd feel a burden lifted as I got rid of things. He was right. First, I tackled the boxes of magazines and newspapers. Really, what good is a Sport magazine from the early '90s with Bo Jackson on the cover? What use is a high-school report card from my senior year other than to see that math isn't my thing? As funny as it sounds, I always thought, "I might need this (fill in the blank) some time." And you know an article on Advertisement Florida State University football coach Bobby Bowden is going to come in real handy while covering religion for the El Paso Times. I quickly put together a box of clothes to give away to a thrift store, before I turned my attention to my DVD collection. This is what made my friends worry. I put DVDs ("Borat," "Sideways" and "Before Sunset" among others) in a box and sold them to co-workers. Maybe the low price of $4 a DVD is what made them ask, "Is everything OK?" The simplest answers on why I decided to get rid of most of my DVDs are that it was an extension of my getting rid of things, plus my laptop computer where I watched my DVDs broke. Even when my laptop worked I hadn't watched most of the DVDs in months. So, it just felt good to get rid of them. Let them bring others happiness. It's all leading me to the realization that possessions, no matter how nice they are or how happy they make us, really don't mean much. I'm not saying I'm ready to give all of my possessions away and become a monk in a forest, but I realize possessions only have the value we give them. Family, friends and good memories are what we should hold on to. OK, maybe I'll keep this Pearl Jam poster, too, until the economy recovers and it can get a nice bid on eBay. There's still a small capitalist inside me, too. 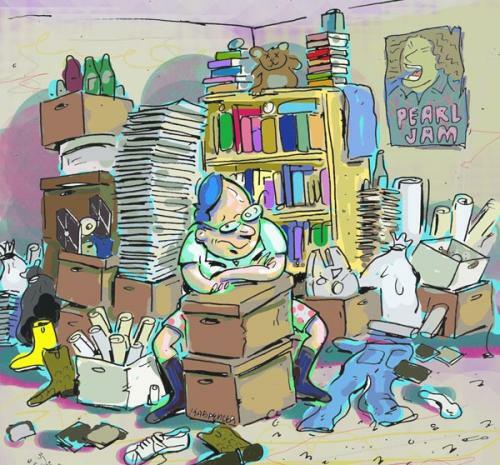 Do you have any "pack rat confessions of your own?" Do you or your family have any "pack rat confessions" they would be confortable sharing. Do you or your co-workers have any "pack rat confessions" that can be shared? If so, feel free to forward the information on this page and/or fill in your "pack rat confessions" below. Do you have a funny, amusing or scary story about how being a pack rat has affected your life or the life of someone you know and/or love? Share it! You can remain anonymous. General Info. Storage Tips General Info. Tips to Overcome General Info. Hi, this is Shelly Morton..the author of this website. I know you hear a lot about how to build an online business, but nothing compares to what you will see when you click the box below. Simply the best way to break the 9-5 routine!